My journey to Hogwarts School of Witchcraft and Wizardy and London Bridge was not as easy as as flying through a broomstick or flying 15 hours non-stop from Manila to London. When friends ask me if applying for a UK Visa is a grueling and laborious task, I couldn't say "yes" or "no" because I find it really easy (the application itself), but the preparation and limited time I had pressed me and my patience. Philippine passport holders need British/UK Visa to visit United Kingdom. My story started on September 19 when I received an invite to visit London for a big launch happening on October 9th. My first dilemma was securing my passport renewal (read about my passport renewal experience - Passport Renewal Experience - How DFA Saved My Trip!) and second was, applying for a UK Visa. I had limited time, but I did everything to get all the information I needed. I asked friends who have visited Europe, pals who are working in airlines and read a few blogs. First, let's start with the agency which handles UK Visa Processing - the UK VfS Visa Application Center. The first step is to know what kind of Visa you are applying to determine the requirements that you need to prepare. You can start the assessment here. As for my case, I needed a Business Tourist Visa. 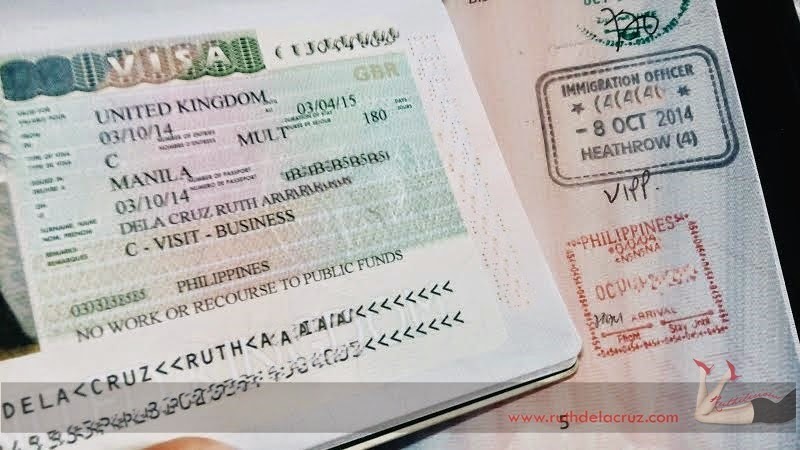 Click Read More to find out UK Visa Requirements for Filipinos..
A valid passport with 6 months validity (I used my passport which is expiring on April 2015 and I have attached the copy of receipt for the passport renewal). If your passport is expiring in 6 months, you might have less chance of getting Visa granted. Two (2) passport sized colored photographs that must comply with the UK requirements (I am telling you I have to remind the photographer over and over again that the size must be compliant to UK embassy requirements). Check the requirements here. Evidence of Current Employment (I have been unemployed and currently doing volunteer work to be able to live Haha :)) Gone are the days I could simply ask for Certificate of Employment and proudly carry the name of IBM. If you are currently employed, simply provide COE from your employer. As for me, I didn't have anything to provide. Bank Certificate - please note that UK requires the certificate to note the date when the account was opened. Most of the banks are aware of this UK Visa requirement. British Embassy is well aware that some applicants borrow money as show-money during application. Clever! Bank Book and photocopy of the transaction from the past 6 months. Credit Card Billing Statements (for the past 6 months) - thank God I have a good credit standing. Dollar Account Bank Certificate - my mom was not very confident about my peso account (I was feeling the same!) so we decided to also secure bank certificate from the joint bank account. Please note that if you are submitting this certificate to include authorization from co-owner that you have authorization to use the fund. I did not include this because my Peso Account is a solo savings account. 6. Details about the accommodation - printed copy of the itinerary, flight ticket and hotel confirmation. 7. Support Documents - I have submitted the Invitation Letter from my sponsor and the confirmation that my flight and lodging would be covered. 8. Medical Certificate - Philippines is listed as one of the countries where you need a Tuberculosis test to enter UK. Side story on this, when I secured my medical certificate, my X-Ray result showed cloudy area on the right lung, the doctor have to request for another view, and thankfully I am cleared. 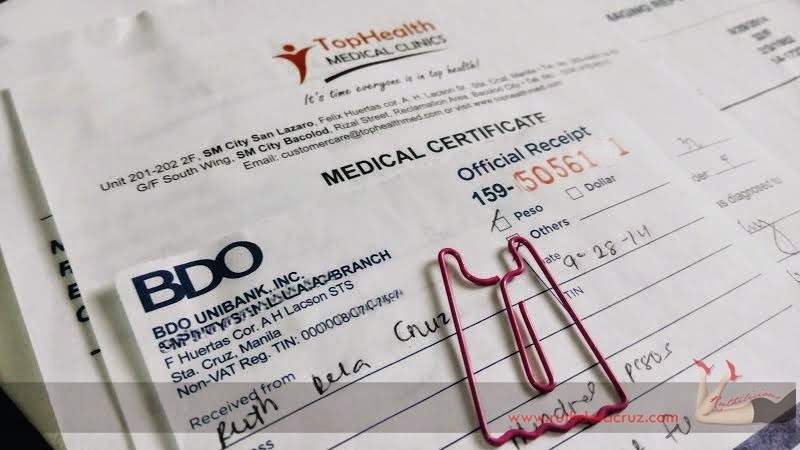 I am so glad/delighted with the services and accommodation of Top Health Medical Clinic because they assisted on expediting my request and I was able to secure it on the same day! 9. Travel Insurance is optional. Unlike Shengen Visa which requires Travel Insurance. I did not purchase, but in case you need, you can check Blue Cross website. After completing my requirements, that was when I processed the application online. Fill in the application form in English. Choose your preferred schedule (you may only select appointment after payment). Confirmation email would be sent to your email address with the link of the completed application form. Print the form and bring it along with your support documents on the scheduled appointment. Note: I applied Monday evening after completing my rquirements - and I was hoping to get an appointment for Tuesday, the earliest appointment I got was for Wednesday October 1st (you could imagine my frustration - my flight was October 8th). I have chosen the 10:40 AM appointment to give me time to travel and commute. I left the house at 8 in the morning and war zone greeted me in the LRT and MRT stations. Thankfully, the next train that stopped had not loaded any passenger from the other train stops, and I was able to get in and made it to the VFS office on time. Whew! Note: Come at least 15 minutes early of your schedule and bring all the required documents with you + photocopies. They would only let you in if you have a scheduled appointment or picking up your visa/passport. Friends, families, fans, supporters must wait outside. There is a cloaking room inside the office where you can leave your bag and stuff (you are only allowed to bring your documents, wallet and phone - on silent mode). There is a Php100 fee for this service. You would be given a number (very much like the Baggage Counter in the supermarket). Proceed to the reception table to confirm your schedule, and you would be asked to enter the door on the right side (UK VISA applicants) - left side is for Canada Visa applicants. VFS also handles different visa applications for different countries. There is a VIP Room next to the common waiting area where you can enjoy refreshments, free photocopy service, etc. There is an additional fee for this, but I didn't take it because the office is quite comfortable, clean and air conditioned. First Desk is for verification of documents. You need to print the guide and check the documents that you have brought with you. The girl asked me if I would need my bank book because they also need to collect it. I said no, and they even asked me to photocopy the transaction history (there is a photocopy section inside - charges Php5 per page I think). All the documents are placed inside a bag and sealed. VFS has no influence on the decision of the UK Visa application. I asked if I can request for expedited application and she said I qualified for the Priority Visa Application (business visitor). She also asked if I want to have the VISA/passport delivered. I decided to choose to pick it up from the office. I thought courier pick up might take another 1 day for endorsement and processing - and I needed my Visa in 4 days! That week, Monday was announced as a special non-working holiday, thankfully, the VFS team confirmed that they were open that day, so as the UK Embassy. I waited a few more minutes for my name to be called for the BIOMETRICS. I got inside the small room, greeted the VFS representative (I could hear a slight British accent with the way he talks) and sat in front of the table. The representative's initial question was, where in UK I want to visit? At this point, I was floating and nervous (you know that feeling when you really want something and you are nervous because you want it!). I thought he was asking me exactly where in London I was staying.. I couldn't recall the name and street of my London hotel! I told him, I didn't get to check all the documents and itinerary yet because I didn't want to be excited about the trip (LOL, very very funny moment for me!). He asked, "is it in London?" And I was like "yes! London! I am going to London because I was invited to go there.. blah.. blah.. blah.."
He then asked for my name, and date of birth. Then he took my fingerprint and photograph. That ended the application process. Then, the waiting game has begun.. The moment I stepped out of the VFS office, I called my friend and told her I blew my chance in visiting UK! My thought bubbles were filled with paranoia. "He might think I were a fraud!" "They would think I don't have enough funds to support myself"
"There is no enough time for UK Embassy to check my application"
"By the time they have seen my application, it is already October 9th - my flight!" I gave VFS until Friday that week to process my application. I went back on Friday (October 3rd - thinking, it has been 2 business days). I went there and spent time and Php100 for the cloaking room because I needed to leave my bag only to leave empty-handed. I cried because I was so devastated and I didn't want to spend that weekend thinking if I was flying or not. I wanted to know the decision that Friday - if I got it, I could start packing; if not, I could kick myself that weekend. The VFS guy who assisted me told me to call or email so I could follow up. He said, they also have no knowledge of the decision because applications go back to their office, sealed and secured. I took it positively. I was thinking, if the visa was not granted, there is nothing to dispatch. I made further research online, and found out it is the text that is sent to those who have their UK Visa granted; while those who were denied UK Visa would received something like "the decision has been made regarding your application". I already told my sponsor and host that I was flying even without my passport on hand! On Monday, October 6th, I asked my friend to come with me to the VFS office (so she could take my bag and I had someone to carry me to the hospital in case I pass out!). I was early for the releasing schedule of 2PM. It was good to be an early bird because there were a few who came in that day. I was the first on queue, and VFS handed me the sealed bag. Overall, the UK VISA application process is easy, smooth and seamless (if you have all the documents ready). It is not as tedious as compared to applying a US Visa. I only spent 1 hour in the office for my Biometrics and submission of documents. The normal UK VISA application and processing can take from 5 to 20 business days. I got mine in 3 days (thank you to the Priority Visa Application). I love that British Embassy makes assessment and decision based on the documents that you have submitted (unlike when applying for US Visa that you get denied in the on-set of interview). I got my UK VISA valid for 180 days :) When I landed in Heathrow Airport, the immigration officer told me I traveled long way just to get to London and he asked me where I was headed after the business trip. I told him I was planning to visit Harry Potter Studio (LOL! As if he would be happy to know that!). What he meant was, which country I was planning to visit after. I said, "I am heading back to Manila". He was probably checking if I were planning to cross countries and overstay. Haha. I hope you find this blog helpful. I couldn't wait to share with you my adventures in London!!!! More travel stories at www.whereiwalktall.com.